Experience Rome, Naples and the Amalfi Coast. 8 eventful days that you will never forget! In addition to Rome, «the Eternal City» with over 2000 years of history and attractions such as the Vatican, the Colosseum and the Roman Forum, you travel further south to Naples, starting point for excursions to the incomparable Amalfi Coast, the sunken city of Pompeii and the beautiful island of Capri. Explore «the Eternal City». Vatican, Roman Forum, the Trevi Fountain, everywhere the eyes are pampered with history and art. Speaking of pampering: Browse through the lively markets and enjoy an aperitif in Trastevere. Overnight in Rome. 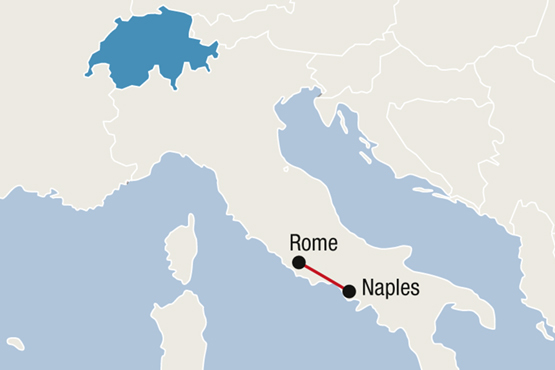 Train ride to Naples. Southern temperament, traffic chaos and the birthplace of pizza, Naples pulsates and is an ideal starting point for stunning excursions. Overnight in Naples. The Amalfi Coast is considered one of the most beautiful sections in Italy. Perhaps you are taking an English-guided day trip along the coast with wonderful panoramic views? Overnight in Naples. An excursion into the Roman period into fabulous Pompeii, which was completely buried in 79 AD after a volcanic eruption, belongs to a stay in this area. 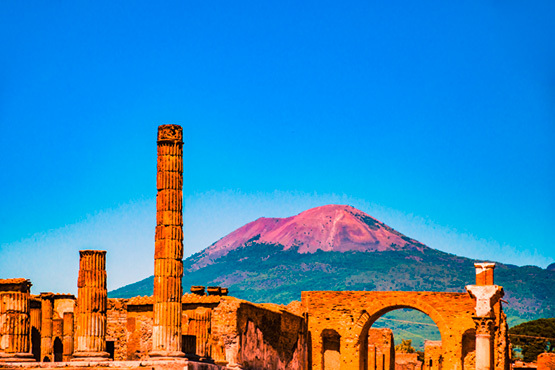 Or take a day trip to the Roman ruins of Herculaneum and the crater of Mount Vesuvius. Would you like to attend a pizza course in English, take a guided city tour or visit the island of Capri? We have a selection of dozens of activities. Train ride to Rome. Enjoy another day in this extraordinary city. Overnight in Rome. Transfer to the airport in Rome. Combine your trip to Southern Italy with any Package in Switzerland, i.e.